TC-3000B Bluetooth Tester is able to analyzer the data of every packet that is transmitted to the upper application protocol layer using the protocol stack, which is developed by us. In addition, it enables the user to examine the transmitting and receiving signal function. 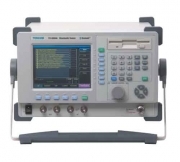 Since it has built-in signal waveform analysis functions such as spectrum analysis, modulation analysis and period power analysis, this enables the user to perform various RF test simply and conveniently. Moreover, since it has important test cases include EDR built-in, it enables the user to check the eligibility of the product standard simply and easily. TC-3000B, Bluetooth Tester. Signal Generator Includes 12 RF Test Cases. 3000-10; Audio Analyzer. Includes SCO Link, Audio Test and Audio Spectrum. 3000-20; Measurement. Includes Spectrum, FM Modulation, Power Channel, Power Time, and BER. [Note] To fully use the *EDR Measurement function, option 3000-20 shall be installed in advance.